Avoid Weekend Diet Sabotage, Plus Buffalo/Bison Meat Info! I'm great at sticking to my diet during the workweek, but I always blow it on the weekend... especially since I dine out more and socialize in food-filled environments. How can I break my bad weekend tendencies without compromising my social life? It can be tough to keep the momentum going once the weekend hits. Here are some specific tips to help you out! Remember your good weekday habits. What helps you stay on track during the week? For me, it's drinking lots of water and keeping smart snacks nearby. Both keep me from getting hungry and turning to bad food options. If you're usually on the go during the weekend, get a big refillable water bottle and keep shelf-stable snacks in your bag at all times. (Click for snack picks.) Consider exactly what works about your personal weekday routine, and try to bring that into the weekend wherever you can. Eat breakfast (and lunch)! Don't skip daytime meals in an attempt to gear up for an inevitable splurge. You may be tempted to save all of your calories for a night out, but that'll just leave you starving and more likely to overdo it. If you're not super hungry first thing in the morning, just have a piece of fruit, and save breakfast for a little later on. Get moving. Take advantage of your days off by prioritizing exercise. If you're going to EAT extra calories, make it a point to BURN extra calories. Get in a workout in the morning, and then go about your day! You can also plan physically active social events with pals: hiking, dancing... You get the idea. Embrace the 80/20 rule. Make smart choices whenever possible to balance out the splurges. If you want to share dessert with friends at dinner, keep your meal pretty light. If you want to have a few cocktails at a club, skip the bar snacks. Click here for TONS of survival guides to help you make those smart decisions! Don't give up completely if you overdo it. An all-or-nothing mentality can be a serious downfall. Don't use one indulgence as an excuse to go food crazy for the rest of the weekend. Get right back on track, and don't be too hard on yourself. I keep hearing about buffalo and bison meat as lean alternatives to beef. But I've seen some fatty buffalo burgers on shelves! What gives? I don’t blame you for being confused on this one. According to the USDA and National Bison Association, "true" buffalo are found in Africa and Asia, while bison are generally found in America (though they're commonly referred to as "buffalo"). And while some product packages say "buffalo" on the front, it's usually North American bison that you'll find listed in the ingredients. Overall, bison is a lot like beef in the sense that there are lean cuts and fattier ones. In general, though, bison has less marbling (read: fat) than beef. It's also lower in saturated fat and cholesterol, and most of the total fat is the good kind (monounsaturated and polyunsaturated). Plus, it tastes a lot like beef! When it comes to ground bison, just like beef, you need to look at the percentage of fat. It's common to see 10 percent, but that's pretty high. Go for stuff that's closer to 4 percent fat (96 percent lean), if you can find it. Beware of premade burgers, too. They're often oversized and made with the fattier meat. 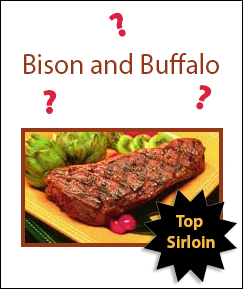 Until bison becomes more widely available, you may want to stick with bison steak (not ground meat or burgers), since it's easier to find lean options. Top sirloin is your best bet. And pay attention to serving size! A 4-ounce portion of cooked top sirloin bison has about 200 calories and 6.5g fat. Today, November 6th, is National Nachos Day. Celebrate with this recipe mash-up of two snack-time favorites, Buffalo Chicken Nachos. And no, it doesn't call for any buffalo or bison!